Could you get mobile service from the same company that provides your cable TV and internet? That’s the idea behind Freewheel, a new service from Cablevision’s Optimum that gives you a mobile phone that only works over Wi-Fi. As Wi-Fi becomes more ubiquitous, often people find themselves bouncing between hotspots rather than staying on the cellular network, so by cutting out the carriers, Freewheel could end up the blueprint for other cable companies like Comcast to offer their own mobile plans. 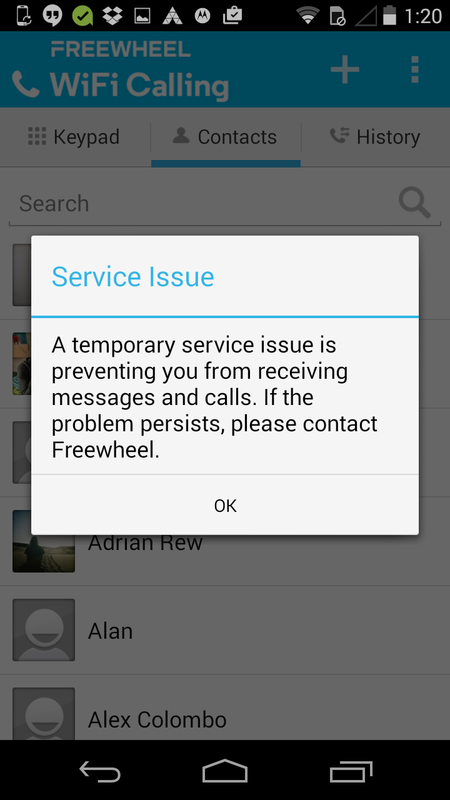 If you’re looking for a smartphone replacement, you’ll probably find Freewheel to be a disappointing service. But if you want a home phone that you can take with you, then Freewheel might be right for you. There’s just one problem: It’s not clear what Freewheel does better — or cheaper — than a traditional mobile phone plan. The only device that currently works with Freewheel is the 2013 Moto G made by Motorola. It’s a fine device, and one of the most cost-effective phones on the market. The full Gigaom review is here. It costs $99.95 directly from Optimum, and you’ll need to purchase it to use the service. It’s not the latest and greatest phone — it’s one generation removed from Motorola’s latest G — but it’s a solid device. And while you’re still on Android 4.4 KitKat at the moment, Cablevision says its phone will get an update to Android 5.0 when it becomes available for the Moto G.
The Freewheel Moto G is basically the same as other versions of the Moto G , but instead of using the standard Android calling and texting clients, Optimum has created its own Freewheel communications apps. A Freewheel widget puts the status of your Wi-Fi connection on the main screen, and when you connect to Wi-Fi, you’ll receive an alert in the notifications pane that Freewheel is available. Optimum also included a few more of its apps, including one for News12, and a support app. Caller ID is handled by Optimum in the Freewheel dialer app, which is nice. Freewheel’s calling apps also support Google-synced contacts. If you don’t have someone in your contacts, your phone might still be able to give you the name of the person who the number is registered to. If you install a third-party dialer like Dialer+ or an SMS app like Google Messenger, it won’t work, but that’s to be expected. Over-the-top messaging and calling apps like Whatsapp and Viber work when you’re connected to Wi-Fi. Optimum hasn’t worked out all of the kinks. In some cases, the Moto G thinks its still a regular mobile phone and it treats the lack of SIM card as a problem. For instance, when you pull the notifications pane down, it still suggests the phone is for “emergency calls only,” as if the device doesn’t have a SIM card installed. The lockscreen is the same story. Without fail, every time you’re looking at the device’s default lock screen, it will remind you that your device can’t make traditional calls. Call quality is fine: Although it’s not quite as clear as HD Voice can be, dialogue is understandable and usually without lag. In most cases, calls don’t take that much time to go through — I tested making a call from the Freewheel and found no appreciable delay when calling a normal cellphone. Generally, I didn’t experience many issues when making a call while in a strong Wi-Fi network, like my home. Freewheel starts to run into issues at the edges of Wi-Fi networks, though. Sometimes Freewheel warns you the audio will be poor and sometimes it doesn’t. There is some wonkiness if you walk out of a network’s range when you’re making a call — you’ll simply lose service. Your device will still think it’s making a call, but no sound will come through its speakers. If you’re at the edge of a Wi-Fi network, sometimes you’ll be able to make a call which will then be dropped immediately. During testing, I called the Freewheel from my cell phone when it was on the edge of a network, and my device simply tried to connect indefinitely. Even worse, if you miss a call while not connected to a Wi-Fi network, you’d better hope that the person who is calling you knows to leave a voicemail, otherwise you won’t get a notification that you’ve missed a call. When back on Wi-Fi, there will be a little red bubble saying there’s a voicemail, but otherwise, there’s no missed call notification. One major reason Optimum picked now to offer a Wi-Fi only phone service is that last year it turned on a new program where Optimum-furnished Wi-Fi routers basically became hotspots — if you’ve got a Optimum account, there’s a good chance you can use your neighbor’s Wi-Fi. Freewheel does a great job automatically connecting to those Optimum Wi-Fi networks. 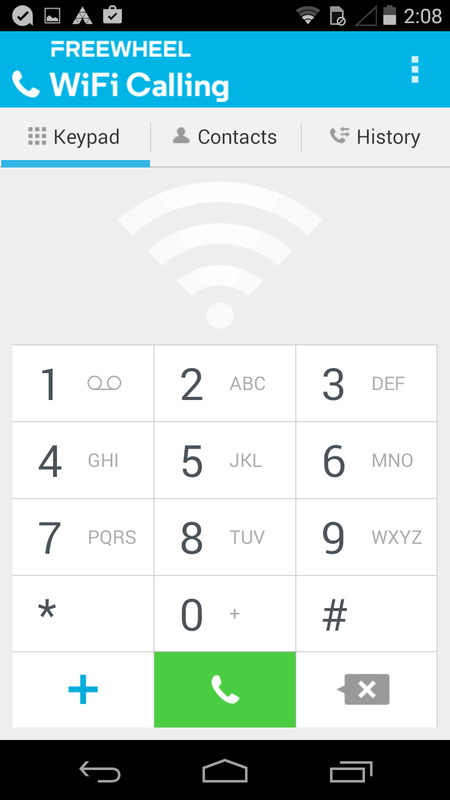 When connecting to Optimum Wi-Fi with other devices, usually you have to sign in with your account in the browser, or set up auto sign-in on the Optimum website with your device’s unique identifier. The Freewheel Moto G simply latches onto every Optimum hotspot it sees like a regular mobile phone connects to a tower. In my building in Brooklyn, New York, the only cable internet provider is Optimum, so it’s covered in Optimum Wi-Fi hotspots. Almost anywhere inside the building, service is great and the device can manage to make a call. On the street, Optimum Wi-Fi is omnipresent as well, but it’s much more difficult to find a strong connection — after all, you don’t know whose router you’re connecting and what walls are in your way. When testing the Freewheel Moto G in the street, I was unable to use Optimum Wi-Fi to place a call, although texts sometimes went through. Even in the most densely packed Optimum neighborhoods, the Wi-Fi mesh isn’t yet strong enough to replace cellular service, a reason why Optimum or other cable companies might want to supplement their Wi-Fi networks with virtual cellular service. Freewheel costs $9.95 per month on top of a Optimum cable internet package, and $29.95 if you’re not already an Optimum customer. At $10, it’s the same price as Optimum charges for a VoIP landline, and Freewheel could be a good replacement for a home phone, although users should keep in mind that as a smartphone, it requires daily charging and doesn’t come with a dock. I don’t think many people are going to sign up for Freewheel if they’re not already Optimum subscribers. There are compelling MVNO plans that come with texts and minutes for well under $30 per month. The main difference is a cellular plan gives you the ability to be reached even if you’re not nearby a Wi-Fi hotspot. Republic Wireless offers a similar Wi-Fi-only talk and text plan for $5 per month, and Scratch Wireless has a service in plan in beta that gives you Wi-Fi calling and even SMS on the cellular network for free . And of course, you can always sign up for a Google Voice number at no charge and use that on your tablet or phone, or you can pay for a Skype number. Small business owners might like that they can have a separate number that can go with them when they leave the house. And I can see Freewheel being a cost-effective way to start kids off with a first smartphone. There’s one scenario where Freewheel makes a lot of sense: It can make domestic phone calls for free from overseas. So if you’re planning a European vacation, you can bring along the Moto G and make free calls to home. Still — even in these circumstances, I believe most people would be better off choosing their own smartphone or tablet and installing Skype with an online number, unless you plan on spending hours talking on the phone, in which case Freewheel could cost less. And while some parents might see Freewheel as a good starter phone, they might be better off with a service plan-free iPod touch or tablet. Sure, your kids will lose out on the ability to text, but they’re more likely interested in using data for apps like Snapchat and Instagram — because who makes phone calls these days? It’s all about whether you’re hooked up to the Wi-Fi. Got my Freewheel phone ystrdy. Still unable to send/receive texts. Idiotic service. It’s beyond me why they just didn’t offer an mvno blended with their wifi. Dummies!